If you think you know what laziness means, look it up again and you'll see Tanaka. 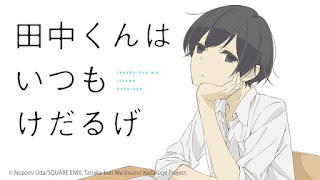 He's the MC in Tanaka-kun is Always Listless, and all he wants to do is lead a peaceful and lazy life that doesn't concern any of the stuff that comes with being the MC. Tough luck Tanaka, you are the MC so you can't wish it all away. I've been wanting to check this out for a while, and since I had no particular anime to check out since Amnesia, I thought I might as well get round to watching this. And I love it. Apart from the very abrupt ending though. But that's just me. So Tanaka is a first year high-school student who doesn't like to have the attention or qualities one gets from being an MC. Not that he looks the MC type. And he doesn't act like an MC either. But that what makes this such a good watch! Bless Tanaka for trying so hard to obtain the lazy and peaceful life he so desires, from being carried around by his good friend Ohta to sleeping in class, and praying to the Shrine for such a life. He will stop at nothing to achieve this goal. I'm sure I speak for everyone Tanaka when I say, don't we all want that kind of life? I guess you could say that given the nature of Tanaka-kun is Always Listless, it has a similar steady pace to Flying Witch, and that balances out nicely with Tanaka being the only one in the entire anime who's quiet and lazy and what not, and everyone else we're introduced to is full of energy and can be crazy at times. Even Ohta, who's like a gentle giant (he's so tall!) and looks out for Tanaka a lot, but he loves sweet food and will always try to get some should the opportunity arises. But there are some moments when things sort of drag, and the anime doesn't pick up again until the next scene, not that that is an issue; it's just something to watch out for. Anyway, these moments we see with Tanaka can literally be made into memes. They're that funny. Like, he uses his listlessness to turn down people who want to be like him or who try to give him attention in a way that would just make him stand out, which totally fails since he acts all, "I don't want any new developments in my life" but somehow they end up becoming friends with him. Add that to other moments such as feeling the warmth of paper fresh from the printer/copier, and suddenly he feels it could be a good pillow for him and tries to sleep on it, and where he's put into a box for the school festival which he ends up sleeping in. These are some of the meme moments that stand out for me, and there's so much more where that came from. Hopefully I didn't spoil anything or too much of the show. Tanaka-kun is Always Listless is definitely one to check out if you're looking for a slow yet funny anime. The only downside is the ending because the final episode didn't feel like the final episode yet, it was. It didn't give the anime a decent sendoff since, unless you checked to see if it was the final episode (which I didn't do), you wouldn't have known it was the final episode until you reach the credits. They seem to give the indication that it's the final episode. Anyway, I digress. I recommend this anime to anyone and everyone, and I hope you all enjoy it as much as I did.